Officially named the Republic of The Gambia, this popular African country lies within Western Africa and generally follows the natural route of the Gambia River. A relatively small country when compared to the likes of African giants, such as Algeria, Sudan and the Democratic Republic of the Congo, The Gambia is approximately 500 km / 311 miles in length, and a mere 50 km / 31 miles in width. It is the beautiful sandy shore of The Gambia that serves as the country's crowning glory, with its multitude of beaches and upmarket holiday resorts making the most of the hot weather and increasing tourism. The coastline stretches for around 80 km / 50 miles in total and is quite simply stunning, offering sun, sand, surf and just a great place to relax, with the most popular beaches including Bijilo, Cape Point and Kololi. Don't be fooled into just thinking that The Gambia is the place for a beach holiday and nothing else. There are plenty of charming fishing villages and wonderful reserves, such as both the Abuko Nature Reserve and the Kiang West National Park. Many of the towns also regularly feature atmospheric markets, with the most notable being held in Serekunda (Serrekunda) and Banjul, the capital city. 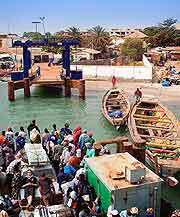 Banjul may not be the biggest African capital that you are ever likely to encounter, but it certainly warrants a visit and is a good place to pick up tourist information and supplies, and also spend some time sightseeing. Apart from the beaches and coastline, many visitors choose to explore the River Gambia, by means of a boat trip. This meandering river connects the Fouta Djallon Plateau with the Atlantic Ocean at Banjul, and offers a huge choice of different cruise packages, being famous for its rich wildlife and beautiful scenery. If you are staying at Banjul, then do set aside some time to explore the bustling Albert Market on Russell Street. Just a relatively short distance to the west is Serekunda and Bakau, where the Bakau Botanical Gardens are brimming with tropical foliage and exotic flowers. To the south, tourists will find that the Brikama Woodcarving Centre makes for a pleasant excursion, while to the east and on the other side of the Gambia River, Juffure Village and its story of slavery is surprisingly appealing. 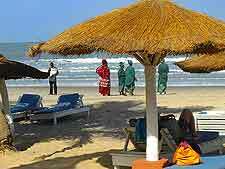 More information about The Gambia Tourist Attractions. 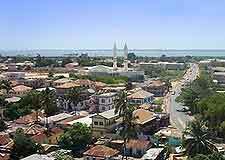 Some of the most important landmarks in The Gambia reside within Banjul. 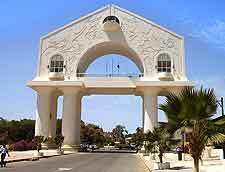 Here you will discover impressive sights such as the Arch 22 and the Banjul State House. Fort Bullen is also located in Banjul and dates from the early part of the 19th century, being built to defend the onslaught of French slavers at that time. Another historic fortress is Fort James, which stands in ruins on James Island and was built in the middle of the 17th century, where it was used to house slaves awaiting ships to the Americas. For something even older, take a look at the ancient Wassu Stone Circles, of which there are around 1,000 in total. These famous stone circles consist of a series of stone monoliths and are believed to have been erected as long ago as the 8th century, to mark burial sites. More information about The Gambia Landmarks and Monuments. 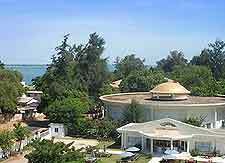 Tourists keen to learn more about the rich and interesting heritage of The Gambia will find the most comprehensive information and archaeological collections housed within the Gambia National Museum at Banjul. Another good choice is the Tanji Village Museum, which features a number of authentic thatched African huts and explains how life is lived within a traditional African village. At Bakau, the Kachikally Museum is known for its huge array of local African handicrafts, as well as its heavily populated crocodile pool. When it comes to art galleries, Banjul, Kartong and Tujereng are the best places to come. In Banjul, the Mama Africa Art Gallery is especially noteworthy and a good place to pick up some original African art. 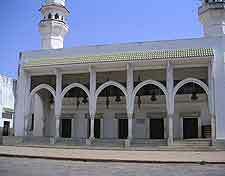 More information about The Gambia Museums and The Gambia Art Galleries. When compared to other African countries, The Gambia it is rather unusual, since apart from its Atlantic coastline, is entirely surrounded by Senegal. Tourists often cross the border to explore the attractions of Senegal, with the capital city of Dakar being within easy reach and amongst the best places to sightsee. Also offering a possible excursion is Guinea-Bissau, which suits the more adventurous of travellers, who favour the city of Bissau and its lively port. To the east, the city of Bamako is situated within Mali and boasts museums, botanical gardens, a magnificent mosque and a popular zoo filled with African animals. More information about The Gambia Attractions Nearby.